diveX Buoyancy compensators - Divemar inc.
Excel Pro weight integrated buoyancy compensator constructed of heavy duty denier nylon with 6 stainless steel accessory d-rings. 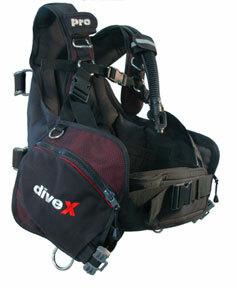 Includes soft padded backpack and twin tank bands with stainless steel cam buckles. Also includes 2 large zippered pockets and adjustable 4 1/2" cummerbund and quick exhaust valve. 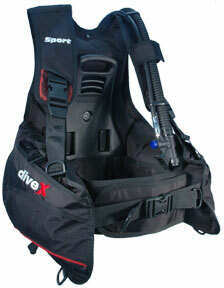 Excel Sport buoyancy compensator constructed of 840 denier nylon. Includes 2 large velcro pockets and accessory nylon d-rings. Adjustable 4 1/2" cummerbund and quick exhaust valve.